The Northern Sydney freight corridor upgrade programme is a $1.1bn project aimed at improving the freight transportation on the Main North Line route. The NSFC upgrade involves construction of a third track from Epping to Thornleigh. The NSFC upgrade programme constructed two new passing loops for northbound and southbound traffic from Gosford to Narara stations. Image courtsey of Abesty. The two new passing loops run up to the Narara station. Image courtsey of Ansend. The new passing loop at Hexham station was completed in June 2012. The Northern Sydney Freight Corridor (NSFC) programme upgraded the interstate rail network between Sydney and Newcastle. The major infrastructure programme is structured to enhance the capacity and reliability of the freight train network and passenger services on the Main North Line. Completed in June 2016, the corridor upgrade accommodates a threefold increase in freight trains and raised the number of freight trains by 15 a day. Australia-based Evans & Peck has supported the New South Wales (NSW) Transport Construction Authority (TCA) in planning, designing and developing various projects under the freight corridor programme, which will help to achieve future demands for more number of freight trains by 2028. "The major infrastructure development is able to accommodate a threefold increase in freight trains." 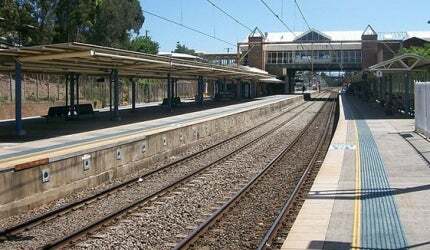 The upgrading programme for the 155km Main North Line route between Strathfield, Sydney, to Broadmeadow, Newcastle, is an intergovernmental initiative. The programme is jointly funded by the federal and NSW governments for a total budget of $1.1bn. A memorandum of understanding (MOU) was signed by the federal and state governments to build a chain of NSFC projects, on 7 December 2011. The NSFC programme was implemented in stages, the first of which included North Strathfield Rail Underpass (NSRU), Epping to Thornleigh Third Track (ETTT), Gosford Passing Loops (GPL) and Hexham Passing Loop (HPL). The federal government has provided $840m towards the first stage, while the state of NSW supported the programme with $214m. The freight corridor programme includes the construction of a 172m-long rail underpass at North Strathfield, a third track between Epping and Thornleigh, two new passing loops for northbound and southbound from Gosford to Narara stations, and a holding track at Hexham. North West rail link is a proposed railway link / line in Sydney which would connect Epping, The Hills Centre and Rouse Hill. The rail link will reduce the congestion along the route and provide direct rail services to the Norwest Business Park, Macquarie Park, St Leonards, Chatswood, the North Sydney district and the Central Business District (CBD). The NSRU site is located between Parramatta Road in the south and Homebush Bay Drive in the north. Construction of the tunnel reduces traffic bottlenecks and improves the reliability and capacity of freight trains and passenger services at North Strathfield. The third track from Epping to Thornleigh joins the existing passing loop from Pennant Hills to Thornleigh. It enables freight to run parallel with passenger trains. The construction of the new passing loops improves the consistency of passenger trains at the Main North Line. Additional paths are constructed for freight trains that are waiting for passenger services to overtake. The new 1,500m passing loop is a corrective measure for freight trains to coordinate effectively with passenger services. The freight corridor infrastructure improvements benefit commuters travelling from the Central Coast into the city. Preliminary work on the construction of Northern Strathfield Rail Underpass began in early 2012. The major part of its construction began in 2013 after receiving planning approval and construction was completed in 2015. "Preliminary work on the construction of Northern Strathfield Rail Underpass began in early 2012." Construction of the third track at Epping to Thornleigh began in early 2013 and was completed by 2016. Work of the GPL started in May 2012 and completed by April 2015. Construction of the new passing loop at Hexham was wrapped up in June 2012. The NSFC programme opens future business opportunities and raises the productivity and competitiveness of Australian industries. Transportation of goods through the mode of railway reduces greenhouse gas (GHG) emissions by more than 100,000t, while the programme saves around 40 million litres of diesel a year.